Falconry has enjoyed a long history of legends and stories alike. 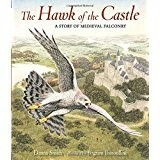 This stunningly beautiful tale is told in verse from the viewpoint of a young girl hunting with father and their hawk. The story is told sequentially during the day, throughout a hunt and concludes with putting the hawk to bed in its mew at day’s end. The spectacular acrylic gouache illustrations bring alive medieval castle life amid authentic panoramas of European countryside. All views of the hawk, as well as of its prey are so realistic as to make the reader think it is a photograph. Upon reading the detailed illustrator’s note it all makes sense as, Ibatoulline, was raised by a falconer father and totally understands this topic. The hawk appears to be gliding right across the cover of the book. On each page a nonfiction text box clearly explains details of falconry using the proper terms. All nonfiction text is presented in italics, which helps young readers distinguish it from the fictional tale. Teachers, librarians and parents will commend the publisher for this important design feature. Curriculum standards can be met in the areas of literature, geography, history, animal life and the arts well into middle school. While the book is also a beautiful read aloud for kindergarten or grade one. Teachers of grade two or grade three will use it in teaching about falconry as an ancient hunting sport, as an introduction to the study of medieval times or as a science book about falcons. It is a story children and adults will want to read again and again. It is highly recommended for all school and public libraries. Extras: Index, Related Readings List, Related Internet sites, detailed illustrator note.